I’ll try to reshoot these in better light so the colors will be more accurate. My sweater is much less puce than it looks here. I’m calling this Brooks Farms colorway “passion fruit” and it’s quite warm and luminous, with shades of redbud, crimson, brandy and marmalade. As you can see, I’ve got some funky spiralling action on the body. Unfortunately, the stitch count I needed for the medium size was exactly right to produce terrible flashing. So I began alternating balls right away, but this was as much as I could do to mitigate the effect. The sleeves are more pleasing to my eye. But you know, I don’t need perfect stripes. What would be the point of knitting a sweater that looks like you bought it at Old Navy? My spirals are offbeat and organic, and sometimes it’s just best not to fight the yarn. I’m almost done with the sleeves. Then Hourglass is going to take a short break while I use these needles to whip up my own personal take on the One Skein Wonder. Yes, you read that right. This self-avowed Shrug Hater is going to knit a garment without a front, against all her better instincts. Here’s the thing: the movers aren’t here yet, and they probably won’t arrive before Wednesday, when we leave for Mr. Garter’s sister’s wedding in Texas and my uncle’s in Kansas City. So what to wear? On a whim, I packed a single dress for the trip across the country. It’s a slinky brown cotton jersey number I’ve always wanted to go dancing in. And since I chose to spend my money on a pair of shoes I could wear to the weddings (I didn’t think my Puma sneakers would fit the bill) and some basic pants and shirts I got on mad sale at Anthropologie (I was going to cry if I had to put on the same two outfits one more time. I’ve been living in these clothes for six weeks.) – oh, and the 25%-off sale Knit Purl was having on Socks That Rock – I didn’t feel I could justify buying a new dress, too. So when I saw a skein of Cascade Sierra in exactly the same shade as my new shoes, I knew what I had to do to complete my outfit. Desperate times call for desperate measures, people. Fortunately, it’s slated to be 84 degrees in west Texas all week. I don’t have time to make anything more substantial. Let the speed knitting begin! And hey, want to see the fabulous present my fabulous husband bought me? Meet Domitilla. She’s a Bianchi Milano Centroventi. (Click the link for better pictures.) This is one sweet bicycle, my friends. She’s like the Mini Cooper of bikes. And she’s a snazzy custom model they made last year for the 120th anniversary – there are only a handful of them in the States, and she had to come all the way from Ohio. I haven’t had my own bicycle since I outgrew the one I had when I was twelve. After that I used my dad’s, and since I left home I just haven’t ridden one. But Portland is arguably the greatest bike town in the country, and since I don’t believe in driving the car unless it’s really necessary, this is how I’m getting around. (Don’t worry, I wear a bright red helmet when I’m actually going somewhere.) She obviously needed a classy and unusual Italian name, so I’m calling her after the little daughter of my favorite pro cyclist, Ivan Basso. I’ve already ridden her to the yarn store in the next town over. Now I just need some of those wicker paniers and an old-fashioned headlamp so I can ride around in a skirt and a handknit sweater with a silk scarf around my neck and look like a Rowan model. Cool Bike! The one-skein wonder will be great. Today, it is warm here in the D/FW area as well. woo hoo! look at that bike.. and that’s quite a lovely spiral you’ve got going on with the hourglass. you and lisa will match! That hourglass looks fantastic. Love the color – it’s going to look great on you! Love the bike too – Mr. Garter is so sweet! Look at you in your cute little biking togs! Somehow I knew that yarn was BF, simply from looking at it. Great colorway, and I’ll bet that it makes a wonderful hourglass. What a great bike! I wish NY were more bike-friendly, it would be such a pleasant way to get around town. Love the bike – ahh if only I could bike around without fear of being smashed by a bus. 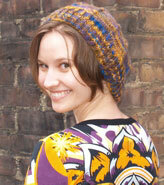 I think the spiraling on the hourglass looks good – better than than pooling to one side! man, oh man is that a sweet ride. what a wonderful gift. i miss riding my bike around. and very nice progress on your hourglass. can’t wait to see it all knit up and done. stay dry now! very nice bike! and hourglass looks just lovely, anyway! and you won’t gain a single pound if you bike EVERYWHERE! We also got Iris a bell that looks like a lady-bug, wouldn’t that be fun on the streets of Portland? The Hourglass looks great! I actually like the diagonal stripes. hey, btw, did you make that sweater you’re wearing in the bike photo?